Peggy Grahame's scamp of a father has just died, and on his death bed, he explained that she would be sent to stay with her Uncle Enos, an eccentric historian, on the allegedly haunted family farm near Goshen, New York. Peggy is skeptical of both her uncle and the supposed ghosts, but she is pleased to meet a young historian named Pat, who accompanies her on the last leg of her journey to the farm in hopes of meeting her uncle. Strangely, upon meeting Pat, Uncle Enos becomes enraged and forbids the young man to have anything more to do with Peggy. While Pat devises ways to see Peggy on the sly, Peggy begins experiencing visits from the ghosts of her ancestors, whose stories about the charming knave, Peaceable Sherwood, and his actions during the American Revolution, slowly shed light on the present-day problems between Enos and Pat. I really enjoyed The Sherwood Ring's blend of fantasy, mystery, and American history. Having ghosts appear to tell their own pieces of the story is a very effective plot device, and I like the ease with which the author slips from the main character's narration into each ghost's monologue. The straightforward and predictable structure of each chapter really makes the story move along swiftly, and Peaceable Sherwood himself is the perfect likable villain, like Westley from The Princess Bride, or an American Robin Hood. 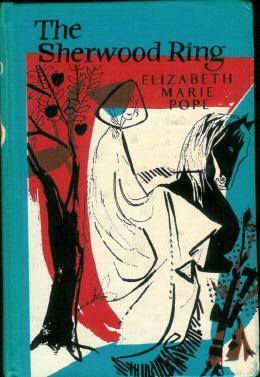 (I wonder, in fact, whether Robin Hood's Sherwood Forest was the author's inspiration for the name.) Peggy herself is not that exciting, but that doesn't really bother me, as it is easy to imagine myself in her place and therefore feel closer to the action of the story. The ending, though somewhat predictable, is really satisfying as well, and though not every segment of the story is happy, I felt a sense of lightness and amusement at its conclusion.